Dockyard is Bermuda’s main cruise ship port and is home to Royal Caribbean, Celebrity, Princess, Disney, Carnival and Norwegian Cruise Lines. Just a 2 minute walk from Cruise Ship Terminals to our Dockyard location. 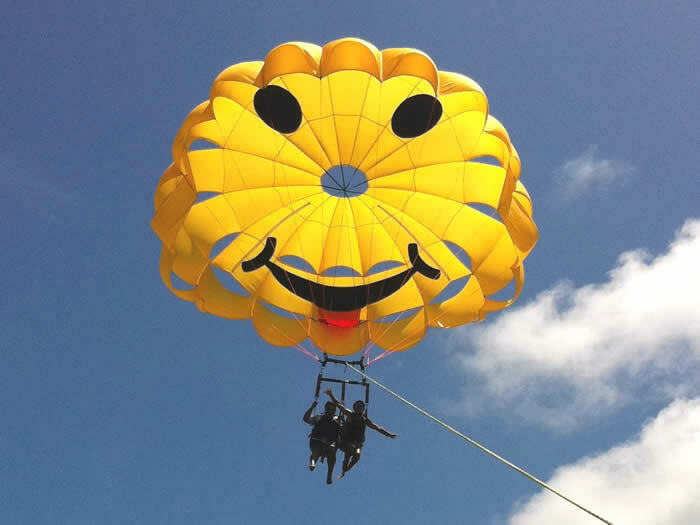 *Both Parasailing Adventures are available from April 10th 2019 – December 23rd 2019. 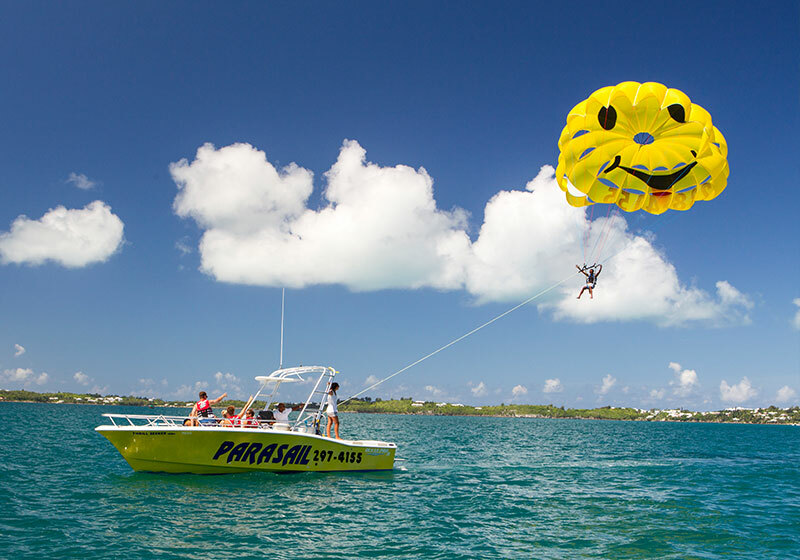 Experience the high-flying thrill, panoramic views and pure excitement of parasailing, plus explore some key sites and places around Bermuda’s coastline too. On this adventure you will soar over coral reefs, historic forts, or the Great Sound harbour, plus after everyone has flown all guests receive a 30-minute sightseeing eco tour of some of the best places to see in Bermuda by water. This can include visiting the sea gardens or sea turtle grounds, the Vixen shipwreck, feeding fish from the boat and even stopping for a short swim at a sandbar too. Our Parasailing Adventure & Eco Tour gives guests an amazing and unique opportunity to see Bermuda from on and above the water. It’s the perfect combination of adventure and fun for everyone! Our professional crew assures you of a safe and memorable experience. This tour is perfect for families, couples and the solo person who seeks fun and excitement on their vacation. Flight time is normally between 8-10 minutes per person. Two persons can fly together (weight restrictions apply). No experience required. (Please note that if the winds are or become too strong for parasailing on any particular day then all guests will automatically receive an extended 2hr Eco Adventure boat tour of the island and its waterways, which will include everything in the Parasailing Adventure & Eco Tour besides flying). *When booking the “Parasailing Adventure & Eco Tour” please be aware that this adventure tour includes flying plus a 30-minute eco adventure tour for all guests onboard. 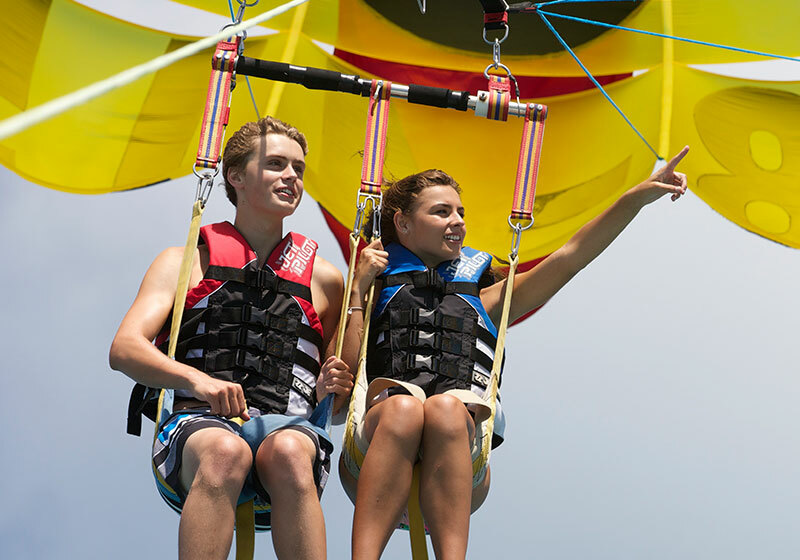 Experience the high-flying thrill, panoramic views and pure excitement of parasailing. This adventure will take you over some of Bermuda’s beautiful pink sand beaches, coral reefs, historic forts, or the Great Sound harbour. Step aboard the “Thrill Seeker” our powerful winch-boat which allows you to take off and land without getting wet, unless of course you request a ‘dip’. Our professional crew assures you of a safe and memorable experience. 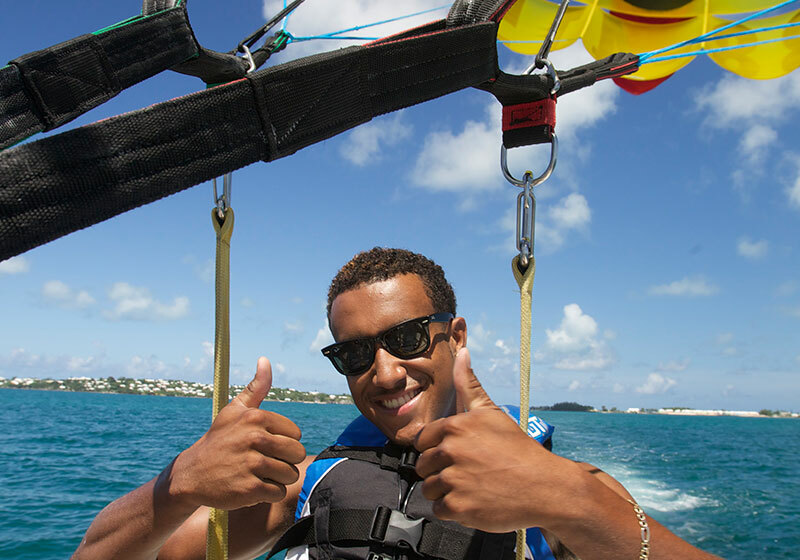 This Parasailing Adventure gives guests the opportunity to see Bermuda from an amazing and unique perspective. It’s fun for everyone! This tour is perfect for families, couples and the solo person who seeks fun and excitement on their vacation. Flight time is normally between 8-10 minutes per person. Two persons can fly together (weight restrictions apply). No experience required. Recommended for ages 5 years old and up. 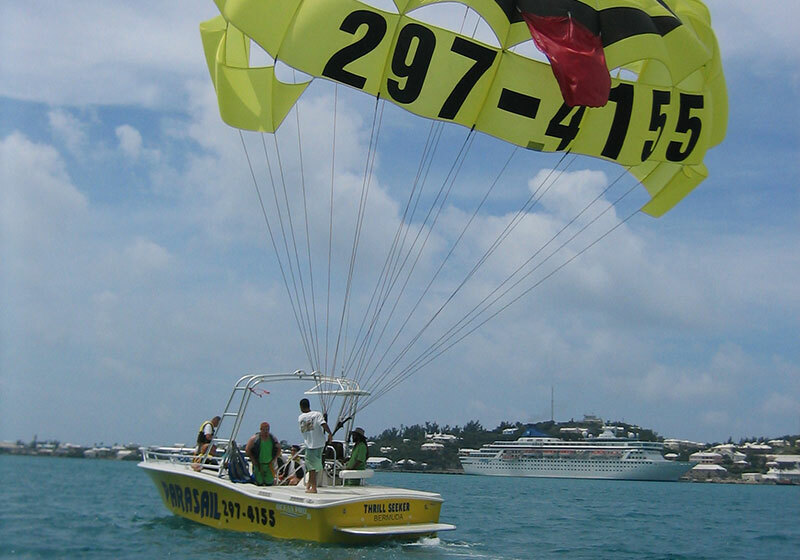 *When booking the “Parasailing Adventure” please note that this tour only includes flying, and does not include the 30-minute additional eco tour. 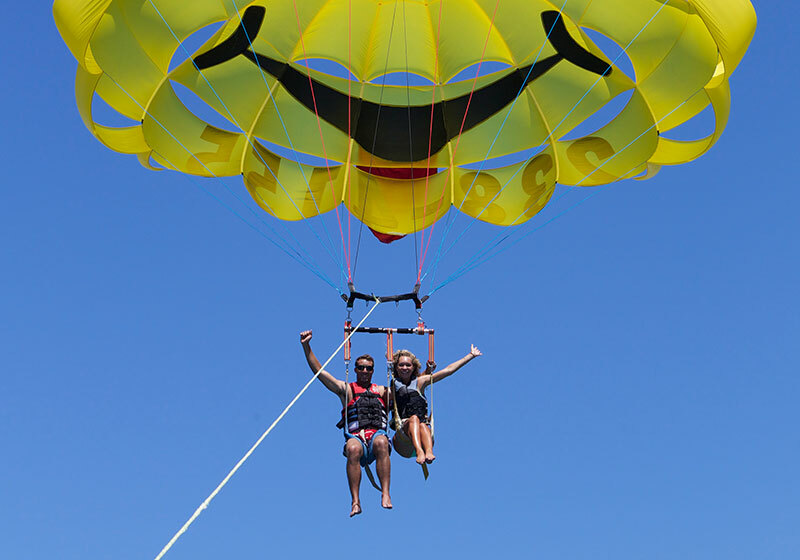 (See the “FAQ’s” section on this website for answers to common questions to do with our “Parasailing Adventure & Eco Tour” and our “Parasailing Adventure”). Also please view the “SCHEDULE” section on the website for times and days that these tours are offered. Alternatively, you can contact us at (441) 238-4155 to find out availability, days & times of departures. Please contact us at (441) 238-4155 or Book Online to book your K.S. WaterSports Parasailing Adventure & Eco Tour or Parasailing Adventure. All reservations should be made in advance to avoid disappointment. Participants must be at least 5 years of age to participate in these excursions. 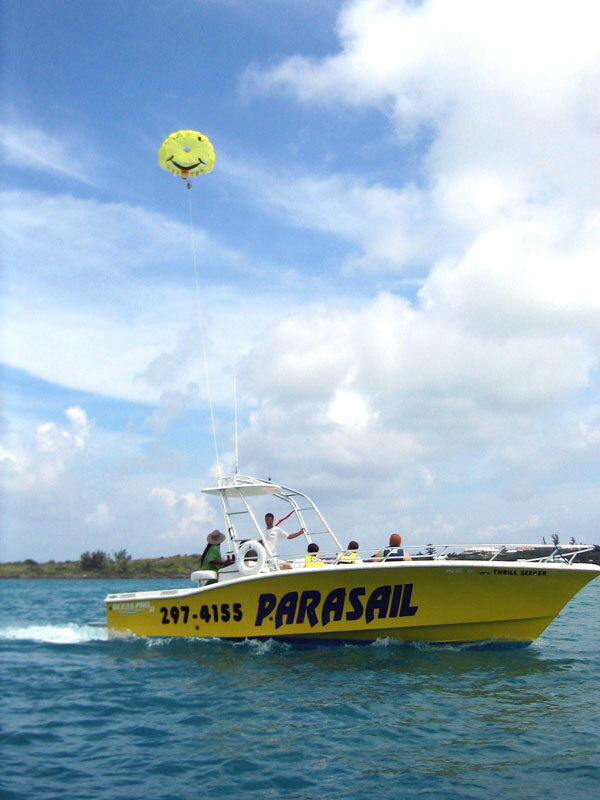 Our “Parasailing Adventure” consists of just parasailing the activity, no eco tour portion. All our Parasailing Adventures and Tours are not recommended for persons with limited mobility or who are pregnant. For our “Parasailing Adventure” if the winds are or become too strong for parasailing on any particular day then guests can be moved to another preferred day and time.